Optional toppings: butter and maple syrup; homemade strawberry or blueberry sauce; fruit coulis; strawberries, whipped cream, chocolate sauce and a dusting of icing sugar; bananas and nutella sauce; cooked apples and caramel sauce; pears and dulce de leche sauce, etc. If you have leftover whipped cream, you can freeze it (see here for instructions)! In a large bowl, combine all of the ingredients except the optional additions and toppings. Mix with a whisk or wooden spoon until you have a smooth batter. Note that the batter will be thinner than most other waffle recipes. Don’t worry, it will rise beautifully in the waffle maker. Gently mix in chocolate chips or blueberries if using. 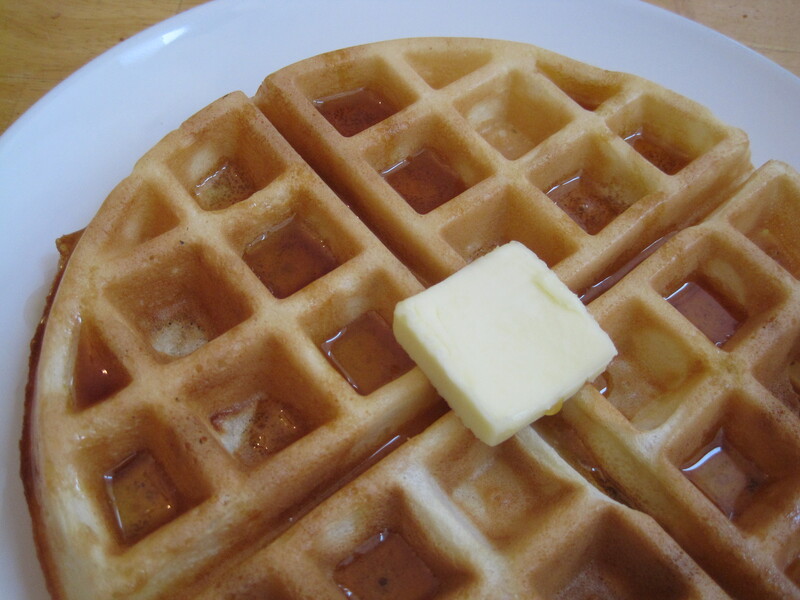 Use cooking spray to lightly grease your waffle maker and heat it as per your waffle maker’s instructions. I used a Salton brand, rotary Belgian waffle maker and I had it on the highest heat setting. Once your waffle maker is hot, pour in one or two ladle fulls of the batter and cook until golden brown, crispy on the outside and cooked through and hot on the inside. This took me 3 to 4 minutes per side. Be sure to allow your waffle maker to heat up fully before you make the next waffle. Also, remove any waffle bits left behind in your waffle maker and spray on more cooking oil between waffles. Serve immediately with a topping of your choice. Freeze the cooked leftover waffles. Toast them from frozen until heated through and crispy on the outside for a quick and delicious breakfast another day. My toaster isn’t large enough to toast the Belgian waffles whole, so I break them up into quarters and toast the quarters separately. I made these last night – yes,for supper 🙂 – and they were wonderful! Thanks so much for another great recipe! could I use applesauce in place of the oil? Or maybe at least half? I’ll bet applesauce would work just fine! If you experiment with it, please let me know how it works out! Also, sorry for the delayed response!